Lockbriar Farm grows as many as 10 different varieties of Strawberries in any given year. By growing early, mid, and late season berries, we can cover most of the growing season. We generally split our strawberry production with U-Pick on the road frontage where we had pumpkins in the past as well as in our back field where apples once were. When the strawberries are finished we will again plant pumpkins in this field. P.S. 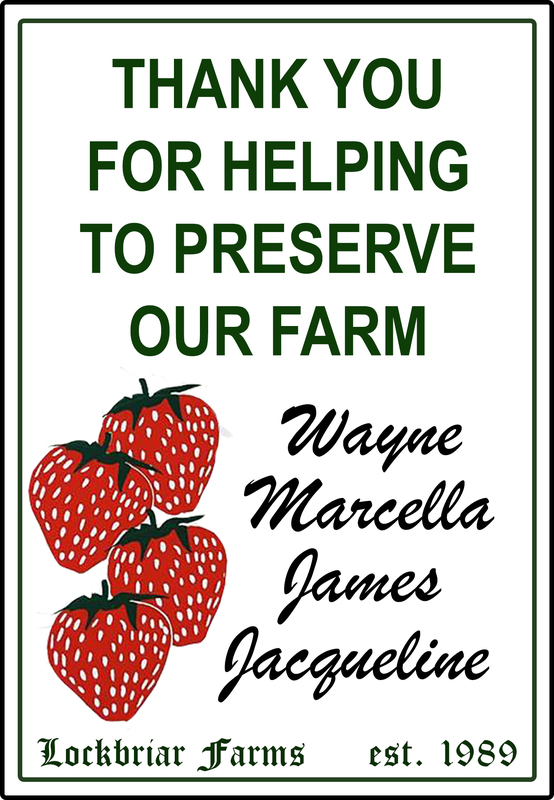 Tell all of your friends so they too can enjoy the big, sweet, juicy, red strawberries at Lockbriar Farms. We have 9 different varieties of blueberries (give or take), covering the growing season from late June thru August. Everybody loves blueberries, and it is no wonder, with their GREAT taste and health benefits with high vitamins and antioxidants. The Chandler variety are the ones we know you all wait for! They’re giant, easy to pick and generally ripen around the middle of the season! We also offer U-Pick blueberries. As you may or may not know, it takes 3 years to grow a blueberry bush that will produce fruit. We always look forward to a good crop! 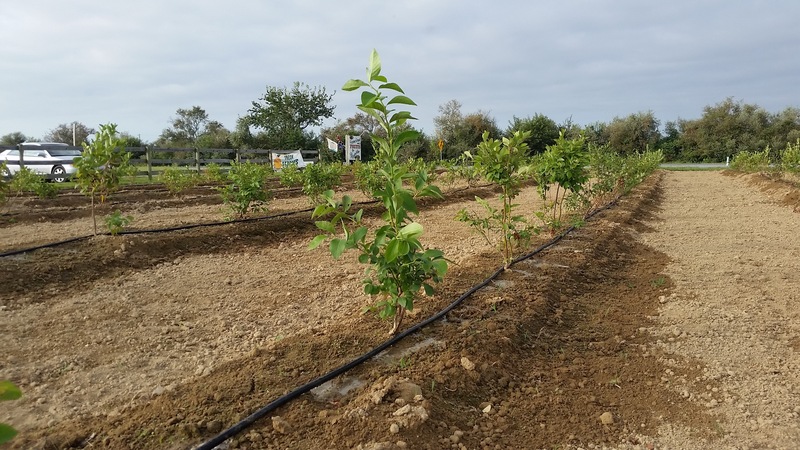 Last Summer, we planted brand new blueberry bushes in our front picking block (pictured below), which should begin producing around July 2018. We have multiple varieties in our blackberry and raspberry “patches”. 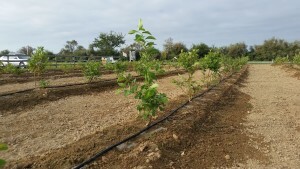 We have a section of Kiowa Blackberries which are one of most popular varieties because of their size and will continue to introduce new berries as they are tested. There will be plenty of fruit for all of our U-Pickers this season. Each variety has it’s own taste so be sure to try them all. Kiowa, Chicasaw, Arapaho are just a few of our Indian varieties. Raspberry picking opened again Summer 2015 after a two year temporary shut down and rehabilitation. We’ve decided to re-plant our Nova varieties, as well as a few test varieties, after losing them to a vicious fly two summers ago. Next year, we hope to have a bountiful crop for our U-Pickers to enjoy! We grow these berries as minor crops in order to provide a little diversity in taste, and also to give people a chance to try something different. These berries were growing here in great numbers during the early 1800’s. They are still grown widely in England and throughout Europe. The currants are used in juices and many people drink their juice instead of orange juice because of the high vitamin C content. Currants also make great sauces for wild game dishes. Elderberries were replanted this past June, both purple and white varieties. For more information please leave a message at (410) 778-9112. We offer over 29! varieties of peaches and nectarines here, at Lockbriar Farms. Starting around the end of June with “Spring Snow” which is a very large, dark red skinned white peach that is very sweet. Just ask those who picked this variety last season. Sentry is our first yellow peach that came into season in 2010. Other varieties during the summer include the great canning peach, Loring and we finish our season with Snow Giant in October. We also grow “Peento Peaches” which are sometimes called “Donut Peaches”. 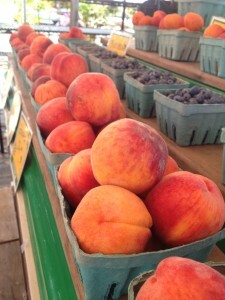 These flat, sweet, white peaches are a big hit for all our customers especially those at the Chestertown Farmer’s Market. We are presently growing test varieties from Rutgers University in New Jersey. One of the varieties is the same color, shape and size as “Saturn”, but is a yellow peach. The second being entirely yellow-colored, and yellow-fleshed; the third being lime green and white-fleshed. These peaches will offer a different visual and taste experience for customers. We will be offering taste tests on these varieties to get feedback from you. We have at least 3 varieties of “Pluots”, which are different from standard plum varieties. They are new to this area and offer color-taste combinations that have been described as “exquisite”. Red Heart is another great tasting plum that we grow. It is purple, heart-shaped, red-fleshed and sweet. We grow “Methley”, which is appropriately called “Sugar Plum” because of it’s exceptional sweetness. Everyone loves a good Sugar Plum… even children who don’t, otherwise, eat fruit! We have 3 varieties of apricots; “Goldrich” comes on in late June, “Hargrande” in July and “Harlayne” in August. Apricots are great-looking and great-tasting, but hard to grow. Some years you get them, and some years they get you! We used to grow at least 10 varieties of sweet cherries here at Lockbriar Farms. Unfortunately the Eastern Shore climate is not suitable for this fruit, causing us to make the tough decision of keeping them and hoping for a crop or putting our farm land to better use. Through Co-oping with other farms, such as Milburn Orchards in Elkton or Eagles Roost Farm and Orchard in North East, we are still able to offer both white and black sweet cherries that will be available in June, July and August. Pie Cherries available upon request.